This one deserves a reward for most misleading game title ever. I’ll have you know that I died more than twice. Take that number two and, two more zeroes to it and my total death count was just a bit over it. All joking aside, one of the most anticipated games of the year is finally here. Wasn’t a hard task since we’re only in March but oh well. 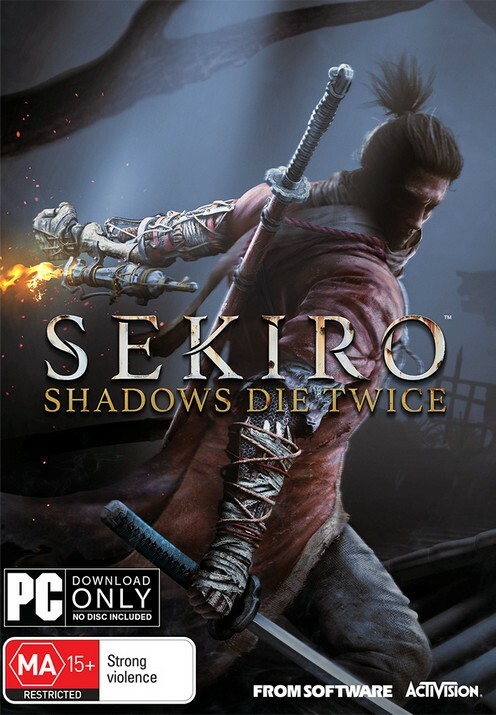 What we all want to know is Sekiro: Shadows Die Twice just a feudal Japan reskin of Dark Souls series or is there a lot more to it.? The answer awaaaaaits…. (omnious horror music)…..down below. You are Sekiro, faithful bodyguard of a Divine Heir Kuro in a conflict-torn Sengoku era Japan. Kuro possesses a gift of immortality, which is why many of the clans are after him, notably the Isshin Ashina clan. After the (failed) battle with Isshin’s grandson Genichiro, you are short of one arm and one divine person that you were supposed to protect. Fitted with a new prosthetic arm and a katana, we are on our way to save Kuro, kill some demons and severely decimate samurai population of Japan while at it. While the game lacks in areas of character customization, it sure makes up for it with an extensive combat system. Sorry, no “fashion souls” this time. However, the unique & challenging approach to battles is what separates this game from the rest. Remember how in Dark Souls games you could roll out of the way of enemies, parry and block? Well, Sekiro is all that cranked up to eleven. The most obvious way to defeat enemies is to be patient and wait for an opening in their attacks but what if they’re blocking a bit much than you want them to? Have no worries, because constant attacking while they block fills up their posture bar and once it is broken….it is time for a shinobi deathblow aka one hit kill. Persistence pays off. Of course, the same can happen to you so don’t go holding that block button too much. You can also break their posture by jumping over their sweep attacks (and then on them) or apply the Mikiri counter to their attacks. A special icon will flash when the enemy is doing their charge attack and then you can either move out of the way or intercept their attack with precise timing of a Mikiri counter. This deals enormous damage to their posture and it is the ultimate test of your skill. Thankfully, controls in Sekiro are incredibly responsive so during my deaths I only had myself to blame and never the game (I did blame enemies often, though). While it is never specifically stated at any point of the game, exploration is the key. Killing mini-bosses and searching through every nook and cranny will reward you with precious gourd seeds and prayer beads. The first is for increasing the use of your healing gourd (Sekiro’s version of estus flask) while gathering four prayer beads will give you the option to permanently increase vitality. After every major boss fight, you also get a battle memory fragment which is used to permanently increase your attack power by one. That prosthetic hand I mentioned above can mean a whole lot in certain boss fights. 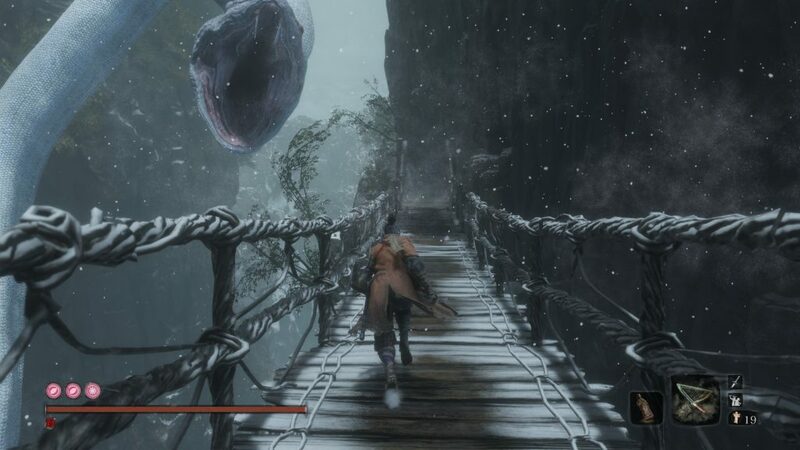 Somewhat early in the game, you come across a boss called Chained Ogre. Despite its size, he is pretty fast with his kicks and grabs. Not to mention the immense damage it does to you if you’re caught in his hands. I died around 30 times before deciding to revisit him after I obtained the Flame Vent attachment for my prosthetic arm. And what do you know, ogres are not fond of fire. Bathing him in fire allowed me to stun him just enough for a couple of free hits. Rinse and repeat and the boss was down. While all bosses can be defeated with skillful use of parrying/blocking and countering, some fights are easier with a right prosthetic tool equipped. Exploring all these interconnected areas in Sekuro is anything but an exhausting task. Mostly thanks to impressive visuals and area design. Later on, you gain access to certain abilities (like diving underwater) that allows entry to more hidden areas and items. One tool that will be your right hand (and an actual right hand, albeit a prosthetic one) is a grappling hook which makes traversing the rooftops and zipping from one tree branch to next incredibly fun. Locations are pretty diverse and you never get the feeling of copy-paste laziness despite so many locations. 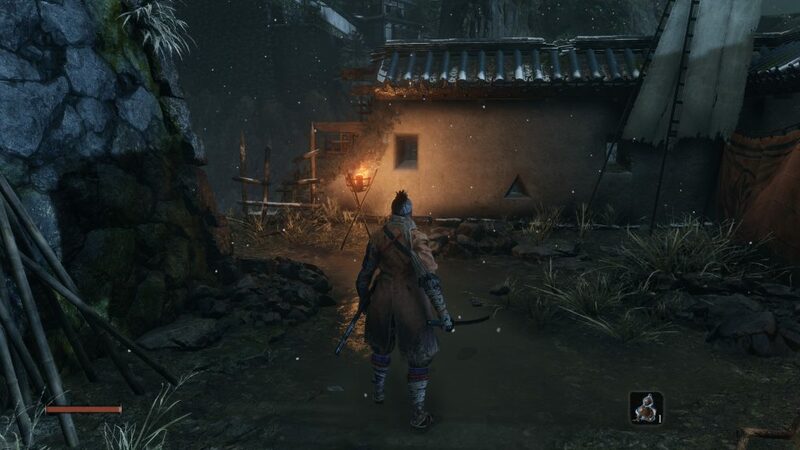 The sound in Sekiro is your faithful ally if you’re going for a stealth approach. Yo have to pay close attention to footsteps of enemies while you’re hidden somewhere in not so tall grass on hanging by the edge of the cliff. You can also eavesdrop on specific enemies if you’re at the right distance. Listening to them can reveal some hints on new areas or prosthetic upgrades. 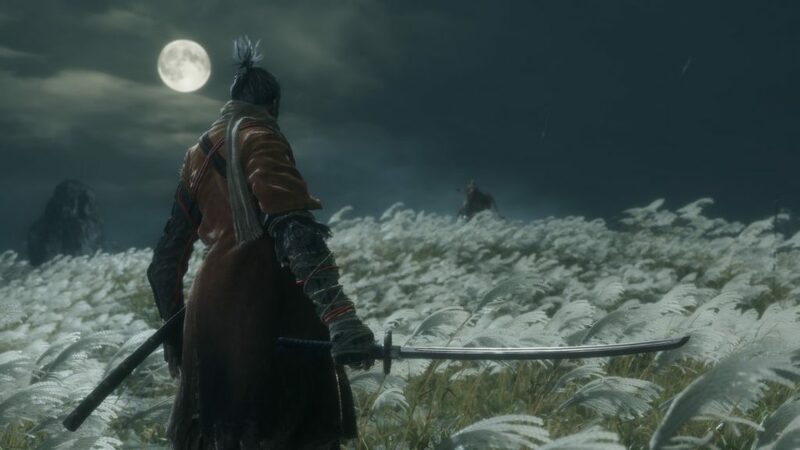 But most importantly, the main purpose of the audio in Sekiro is to get your adrenaline pumping during boss fights. Certain tracks are so good that I wish I could revisit those moments later, but if that also means going through some bosses again (I’m looking at you, Lady Butterfly), then I’m good as it is. Maybe for a second playthrough with all my skills and items kept. All in all, Sekiro is a strange release. In this age of microtransactions, loot boxes, shoehorned multiplayer/co-op and multiple season passes – we have this. A strict singleplayer game with all of the content on day one. That alone is praiseworthy. 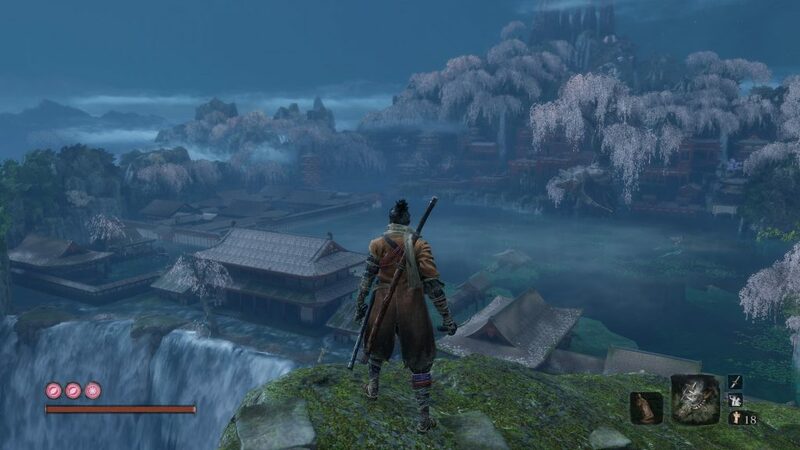 With that said, Sekiro is not without any flaws. While I enjoyed the story and level design to a great extent, the story progression is something that shouldn’t be so vague. Handholding in games is not my thing but some hints should be a bit more elaborate than “go to the back of the castle near that tree by the lake”. If you found Dark Souls series challenging as much as engaging, then Sekiro might be your cup of tea. Tough and challenging but never unfair. All of Dark Souls games were just an elaborate tutorial for Sekiro.